Have you heard about the new book, The Gluten-Free Edge: A Nutrition and Training Guide for Peak Athletic Performance and an Active Gluten-Free Life? I just finished reading it….AND I loved it SO much that I am giving away a copy of it along with a pedometer to motivate a lucky winner into action. The Gluten-Free Edge was written two people I highly respect and admire in the Gluten-Free Community. Peter Bronksi, award-winning writer and endurance athlete, and also the co-author of Artisanal Gluten-Free Cooking and founder of the blog No Gluten, No Problem; and Melissa McLean Jory, MNT, nutritionist, wilderness adventurer, yoga enthusiast, and founder of the blog Gluten-Free For Good. 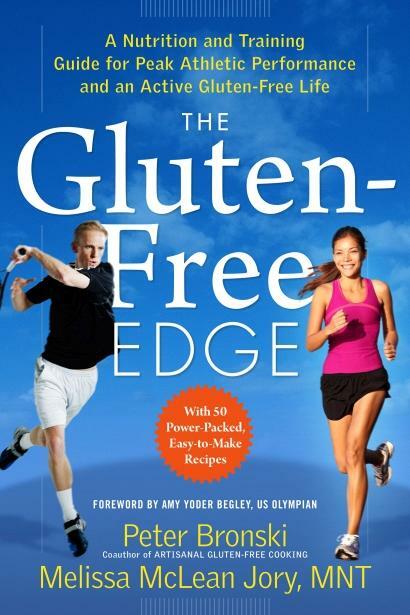 This book addresses how you can gain an edge in sports and in life by going gluten-free. It talks about how science is showing more and more that gluten can have a negative impact on our health, regardless of whether or not we have Celiac Disease. I love that many of our own local sports celebrities here in our town have been very vocal about their choices to go gluten-free. My own children feel like having a special diet is now more like a cool badge rather than something to be embarrassed of. My oldest is even convinced that the reason he is “such a great baseball and football player” (his words exactly) is because he is gluten free. Of course, his reason to be so is not by choice, considering he has Celiac Disease. This book is packed with amazing information backed by science, research, and history. 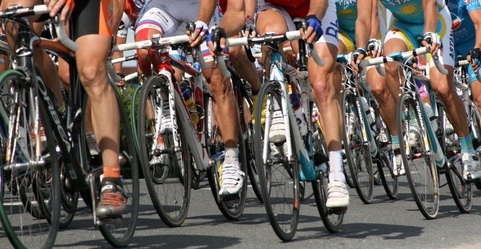 It has amazing personal accounts from many of the elite athletes. And it provides a realistic approach to food as it relates to how to achieve peak athletic performance, not only for the serious athlete, but also for the weekend “warriors”. Along with some amazing nutrient dense recipes, The Gluten-Free Edge also has a great list of whole, fresh foods, full of complex carbs, lean proteins, and healthy fats that are all completely gluten-free and that will leave you feeling full of energy. UPDATE: THIS CONTEST HAS ENDED. WINNER HAS BEEN CONTACTED BY EMAIL! Now. One lucky winner will win a copy of this book AND a pedometer to motivate them into action and on the way to an active gluten-free life. To enter to win, just simply do One, Two, or all Three of the following. Just leave a separate comment for each thing that you do so that you can earn an entry for each. 1. Follow Cook It Allergy Free on Facebook, or tell me if you already do. 2. Follow Gluten Free For Good on Facebook, or tell me if you already do. 3. Follow No Gluten, No Problem on Facebook, or tell me if you already do. The contest will end on Wednesday, September 26th at 9.am PST. The winner will be announced then. You must be at least 18 years old to enter. I follow Gluten Free for Good on Facebook! I follow No Gluten, No Problem on Facebook! I follow No Gluten, No Problem o facebook! Following Gluten Free for Good on FB! Kimmie, the picture of the male athlete playing tennis on the cover of the book looks like Kurt!!! Sounds like a great book. I already follow you and have the app! Great app for meal planning – still playing with sugar substitutions! I follow you on facebook!!!!!! I already follow Cook it Allergy Free. Thanks! Just started following all 3 on FB! The books sounds awesome! Thanks!! I already follow Cook it Allergy Free on facebook. Would love the book! Wow, thank you for this endorsement. It means so much to me and to Pete, as well. We’re excited about the positive responses we’re getting to the book, and as a mom, to hear that things have changed enough that your boys feel being GF is what is giving them their super-powers absolutely makes my day (I say with tears in my eyes). That is what this book is all about — we want people to find the tools to thrive. Not just “get by,” but to really thrive and be a “great baseball and football player.” I love that!! I follow all 3 on FB now! I have followed Gluten Free For Good and No Gluten, No Problem for a while. Cook It Allergy Free is new to me and I like it! Thank you! I am now following all three blogs and love them. And I sure would appreciate a copy of the book. I am passionately training in the martial arts and would love to read your book! Cant wait! And just in case I don’t win the give away, is this available on Amazon? I follow all 3 and am in the beginning stages of converting my diet over. Thanks! I follow Gluten free for Good! I like cook IT allergy free. I liked Gluten Free For Good. I liked No Gluten, No Problem. Thanks! I follow – Cook It Allergy Free on Facebook! Great giveaway! Follow you on facebook! Follow GF for Good on facebook as well. Also follow No Gluten, No Problem on FB! I follow Gluten Free, For Good on Facebook! Now this book, I NEED to read! I can’t wait to check it out! I like you on FB already! I liked Gluten Free For Good on FB! I liked No Gluten, No Problem on FB too! Hello! I follow cook it allergy free on Facebook. Thank you!! I liked no gluten no problem. Thanks! I follow No Gluten, No Problem on Facebook. I already follow #1 on FB. I like Gluten free for good, cook it allergy free and No Gluten, No Problem. I would love to have this cook book. I LIKE No Gluten, No Problem and Cook It Allergy Free. I LIKE Cook It Allergy Free already. I liked Gluten Free for Good on Facebook! I liked No Gluten, No Problem on Facebook! I LOVE Cook it Allergy Free; have it on my iPad and have referred many people to it! Still working on sugar substitutions though…they don’t always come out tasting like what my girls want them too…hard when you’re dairy free and wheat free then cannot have sugar! !